So I did this project with my 9th grade algebra students in 2013-2014 called Projectile Motion. As the name might indicate, it’s about modeling the path of a projectile with an equation and graph – classic quadratics. which has all sorts of cool uses. 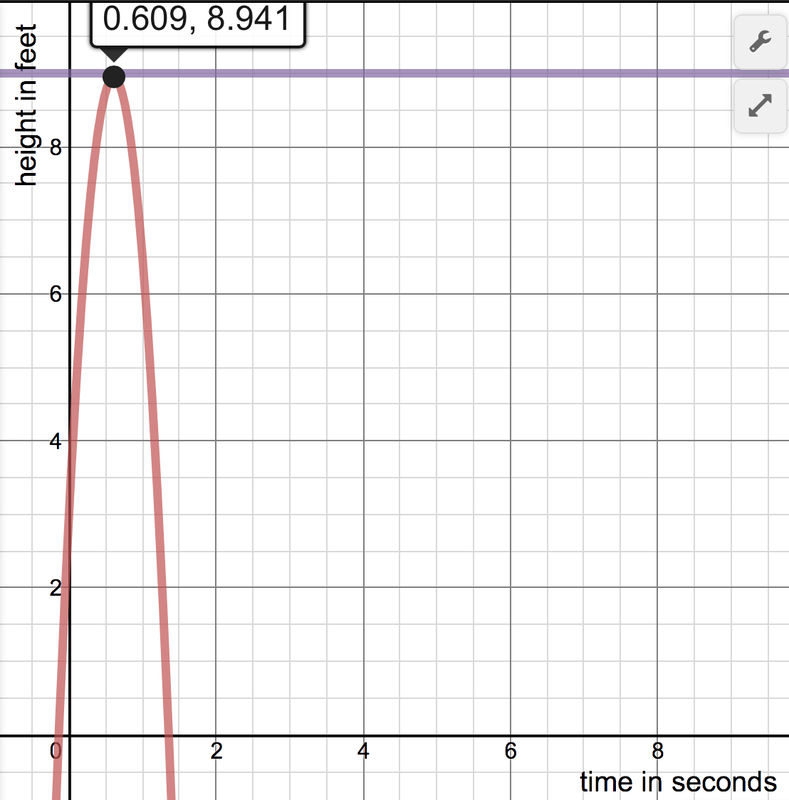 It can, for instance, be used to work backwards to learn things about a projectile, like if I throw a pen up in the air and we know how high it goes and how long it takes to land, we can figure out with how much velocity I threw it (by adjusting the velocity parameter on a Desmos graph like this). I find that pretty neat. When quadratics have come up the past few years, I’ve tried to get students to share in my fascination and enthusiasm for projectiles. This year, for the first time, I was actually a little too effective at that. Let’s just say that my sales pitch caused a small uproar when students found out that this equation ONLY works for projectiles that go straight up or down. I had a kid who was trying to model a football kick into a basketball hoop; a kid who was trying to model a Evil-Knievel-esque jump attempt and about 100 more kids who actually had interesting ideas for this project and were doubting my promise that math and real life are in any way connected. To be honest, I didn’t know the answer. I learned basic projectile algebra by using the aforementioned equation and, unlike my students, never had the gaul to ask “What happens if a projectile isn’t launched perfectly up and down?” For all I knew, when projectiles are launched at an angle, math breaks. Like my students, I was a skeptic. So I looked it up. And what I found actually made me love quadratics and projectiles WAY more. If you already know how real projectiles work, skip the next paragraph. Basically, to model a projectile launched at an angle, you need a function of time for the horizontal position (xp) AND vertical position (yp). Each function looks like the formula I know and love (the h(t) function mentioned earlier), except that the one for horizontal position has no -16t2 since gravity doesn’t go left-and-right and thus doesn’t affect horizontal position. Anyway, on any launch, a projectile has an initial velocity, some of which is “distributed” to an initial HORIZONTAL velocity (vix) and some to an initial VERTICAL velocity (viy). How much velocity is “distributed” to the horizontal direction and vertical direction depends on the angle of launch (Θ). I was so fascinated by this, I made two things. First, this worksheet that I hoped would consolidate and clarify this revelation for any students interested. Second, a video that outlined some additions they could add to their project. The results, which I’ll share next, were surprising.